Letterpress, emboss, and die-cut, all with the same versatile tool! 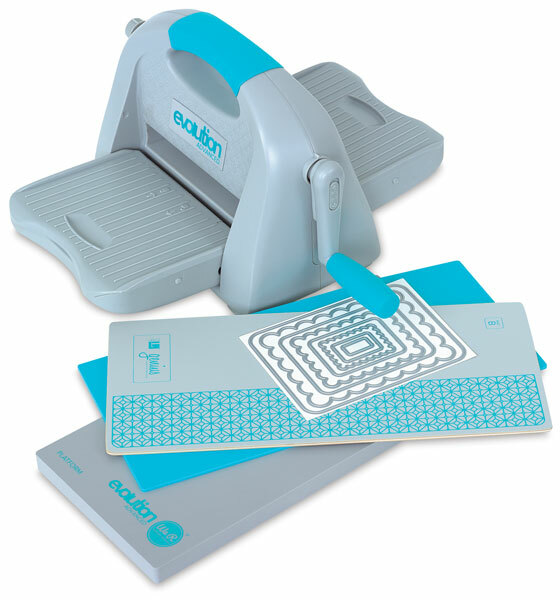 The We R Memory Keepers Evolution Advanced Tool is a lightweight, portable unit that works with leading brands of dies and embossing folders. It includes a 6" × 13" (15 cm × 33 cm) cutting and embossing platform, two mats for die-cutting and embossing, and a bonus nesting die. Other features of the Evolution Advanced Tool include suction cup feet for no-slip cranking, an easy fold-up design, extra built-in storage, and a removable crank for the optional motor. Removable Motor — This removable motor is ideal for high-volume projects. ® We R Memory Keepers is a registered trademark.